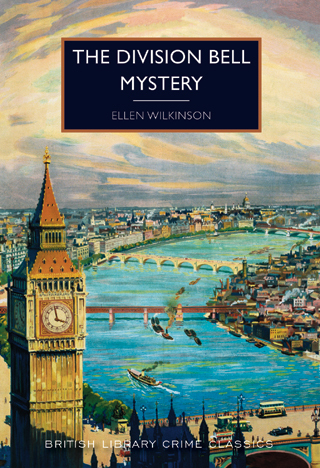 The Division Bell Mystery by Ellen Wilkinson – Book Review. British crime classic. Many politicans have turned to writing, either to supplement their (perceived) meagre income – diaries, biographies (of themselves or others), memoirs or fiction. From Disraeli to William Hague, they’ve all had a go, Churchill being the most prolific. Less remembered, however, is Labour MP turned writer Ellen Wilkinson, who was Minister of Education from 1945 until her death in 1947. Written in 1932 The Division Bell Mystery centres on the death of a financier during a dinner at the House of Commons. Wilkinson describes the labyrinth-like buildings which could have allowed the murder a quick, unseen escape. But is this more of a ‘locked-room’ mystery? The Home Secretary, who had organised the dinner, wasn’t in the room at the time. A parliamentary private secretary, Robert West, gets to grip with the case, helping the pedestrian-like police to get to the bottom of the mystery. Along the way Wilkinson paints a first-class picture of characters (and while West is a Conservative, there’s no opposition-driven animosity in Wilkinson’s story-telling) but also the layout of House and its procedures. For anyone who is interested in the House of Commons, but also likes a truly good yarn, this story, written in 1932, fits the bill brilliantly. There aren’t too many twists and turns to throw readers off the scent, but here is a well-constructed, imaginative take on the classic-era murder.